Holopathy is a new method in holistic medicine. Its aim is to activate and optimize the body’s regulation system and thereby to strengthen its self-healing capacities. The concept of holopathy has been shaped by its founder, the Austrian practitioner of holistic medicine Dr. Christian Steiner. The name comes from the Greek: holos = whole, pathos = to feel, to sense. The approach of holopathy is to first analyze the state of the body’s energy system using special measurement techniques, and then, on the basis of the results of this analysis, to optimize the energy system and bring it (back) into equilibrium. 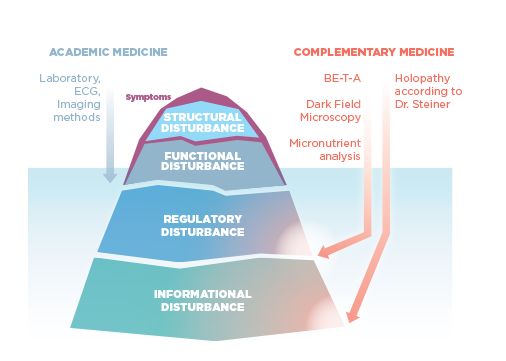 Holopathy combines traditional Chinese Medicine (TCM) with Western Natural Medicine (homeopathy, herbal medicine) and new results from biophysics and energy medicine. The basic principle of holopathy is to build up energy resources and activate self-healing capacities. Holopathy treatment has two aims: regeneration of the body’s own energy system and elimination of accumulated toxins. Only together can these ensure that the body’s self-healing powers can work at their full natural capacity. The result: a targeted, cause-oriented therapy which can often be effective when previous treatments have not helped enough. The treatment is individually adapted to the patient and has no side effects. Holopathy has been utilized in medical practices and in clinics since 1994. Since then it has demonstrated its value in thousands of cases, often as an ideal supplement to conventional medical treatments. There is no doubt that chronic illnesses are on the rise. Whether it is allergies, autoimmune diseases, susceptibility to infections and nonspecific pain, mood swings, headaches, tiredness, exhaustion etc. – from the standpoint of holopathy, all have the same basic problem in common: chronic energy deficiency. All biological processes in the body are regulated through the higher-level energy of the acupuncture meridians and the nervous system. Physical and psychological stress, continual excess demands, false and denaturalized nutrition, electrosmog and environmental toxins can interfere with this natural regulation. The body reacts to with a chronic stress syndrome. Sooner or later this constant stress blocks body energies and weakens the immune system. In the longer term a chronic energy deficit arises which can manifest itself in a large variety of symptoms, including for example general discomfort, exhaustion, allergies or chronic illnesses. Many patients have experienced this problem themselves: In cases of chronic illness, conventional medicine is often not sufficient. Patients are often classified as “psychosomatic” and more and more drugs are prescribed to handle their symptoms, without doing anything about the root causes. A very frustrating situation. Such cases require a therapy that builds up the body’s energy system up to the point where the regulation system is activated. Thereby the self-healing powers of the body are put back into motion. Exactly this is the aim of holopathy. Holopathy is based on a completely new principle. It uses the “electronic footprints” of substances with healing properties. A fingerprint is an electromagnetic vibration which the given substance constantly emits and which is characteristic for that substance. The body detects these subtle material vibrations via the acupuncture meridians rather than the sense organs. Thanks to holopathy it is now possible to transmit the fingerprint-vibrations of thousands of substances to the patient via low-amplitude pulsating electromagnetic fields, without direct physical contact. By means of electromagnetic fingerprints it is possible to transmit exactly the type of energy which the individual patient needs. The result: an immediate, noticeable boost in energy. Subtle-material vibrations arise in all areas of medicine and the environment – from herbs, trace elements, homeopathic substances and natural medicines, minerals and foodstuffs, to environmental toxins, bacteria, fungus and parasites. Holopathy goes even a step further: it can help the body to protect itself from the health dangers of today’s world. Examples are electrosmog, environmental toxins, heavy metals, toxins in food, new types of germs as well as exhaustion of the vegetative and immune systems. Holopathic treatment also counteracts the higher-level causes of organic disturbances, such as chronic stress for example, and the resulting abnormal reactions of the body’s regulatory system. In this way holopathy creates the preconditions for a sustained recovery, even from protracted illnesses. Holopathy acts via the body’s own regulatory system. For this reason there is a good prospect of success in cases where no irreversible damage has yet been done to body tissue (organs). In the latter case holopathy cannot provide a cure, but nevertheless can often substantially reduce symptoms and improve the quality of life. Despite its many applications, holopathy is a very gentle treatment. This is because the electromagnetic fields which it employs to transmit the vibrations of the various substances are extremely weak compared to the technically-generated fields which surround us. The field strength is comparable in order of magnitude with the natural magnetic field of the Earth. This makes holopathy well suited for treating children.